This Elbow Faceout mounted to Grid turns a precise 90° right angle to make itself seen. The vertical flange on the backplate, keeps it from being jostled sideways, while the grid is undersized relative to the endcap width and the short Faceout arm does not extend beyond into the cross aisle. Still there might be some minor interference with passersby. This winged extension to the grids was not employed extensively throughout the store, possibly because of the safety issue. But it did find occasional appropriate applications like this, offering customers carry bags. I suggest another application might be mid-grid allowing items to be draped yet face forward. 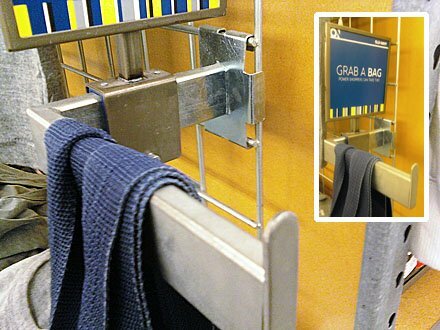 SEARCH “Amenity” for fixtures catering to customer convenience and comfort, as in these carry and shopping bags, or “Best Practices” for discussion of safety and other issues.